The school year has started off with an insane amount of chaos and exhaustion, as every year does. 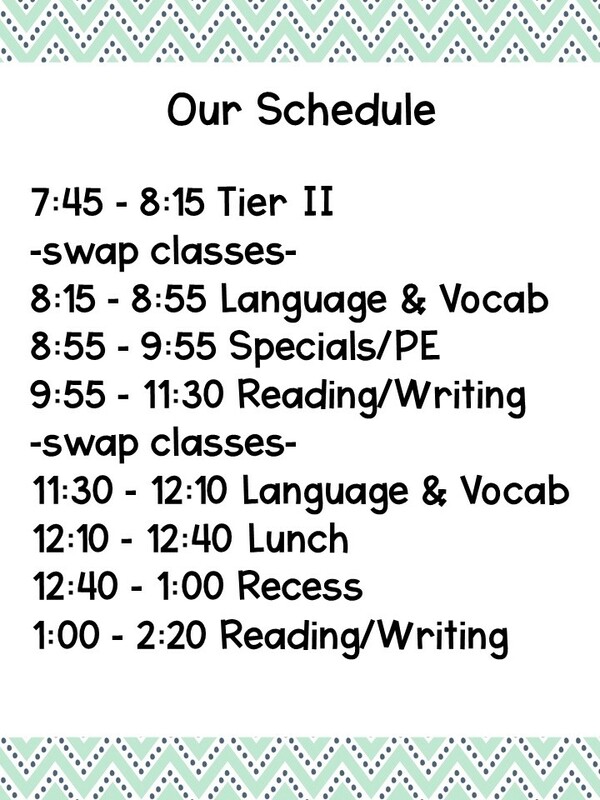 Tomorrow, we'll be entering into our third full week of school and for the first time ever, I have my classroom schedule figured out in a way that actually works!! I teach 2 classes Reading, Writing, and Language. My first year teaching fifth grade, I had 3 classes and felt like I had absolutely no time to teach everything. We moved to team teaching last year where I felt like I had so much time, yet I never got to teaching writing units. Writer's workshop has always been my biggest struggle to fit in. I have absolutely no excuse for it, but I have definitely failed in that part of teaching. But, third time is a charm, right?! Must be because I finally think I have it together. My school basically let us put together our own schedules this year after they figured out our specials and P.E. schedule. 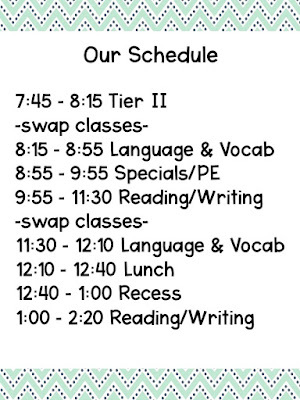 My co-teacher and I like having Tier II intervention at the same time and first thing in the morning. This allows for both of us to pull from each other's classrooms to work with students on their needs. We also don't have an excuse not to get it done since there's never assemblies or interruptions that early. I add in Language depending on what we're discussing for Tuesday-Friday. Monday is very heavy for vocabulary so I don't work on skills that day, but it gives us plenty of other chances to work throughout the week and add into other subjects like reading and writing. When we come back from our break (Specials/P.E. or Lunch/Recess) we jump into reading. Each day is different for this, but since I teach through novel studies, I will usually do a mini-lesson to introduce a new reading standard whenever I feel it's necessary. It's not every day, but sometimes it comes in. Then, we'll read our novel for about 20 minutes every other day. On the days we don't read, we will discuss our reading and work on that reading standard through the novel. I'm trying a new thing this year for reading called the Socratic Seminar. I'm using Lucky in Fifth's resource to get me on the right track for this with Wonder. It seems to be going well so far and my kids love hearing each other's opinions on the questions. It's really interesting to hear their thinking and see it change as we discuss. I would like to point out real quick that I am not a "give a test every Friday" type of teacher. This is just a preview of my plans from last week. We've been working on inferencing and summarizing for a solid 2 weeks and felt like we were ready for a test this week. It just happen to fall on a Friday. I'll be introducing a new standard next week and probably won't test on it for awhile. Also, on Friday's, we don't work on our novel study. This is our day to work on nonfiction text and do some fun skills practicing. Since all of my novel studies are fiction, I need time to incorporate nonfiction into our weekly activities. However, I do try to relate the nonfiction texts to our novel studies or what they're learning in Science and Social Studies. The remainder of our time in class is different depending on the day. Monday and Tuesday, I do 40 minutes of small groups. On Wednesday-Friday, I do writer's workshop. I know I should be teaching writing every day and doing small groups every day, but y'all I don't have time! I really utilize my Tier II time for my small groups every day to make sure I'm getting down deep with my kids. 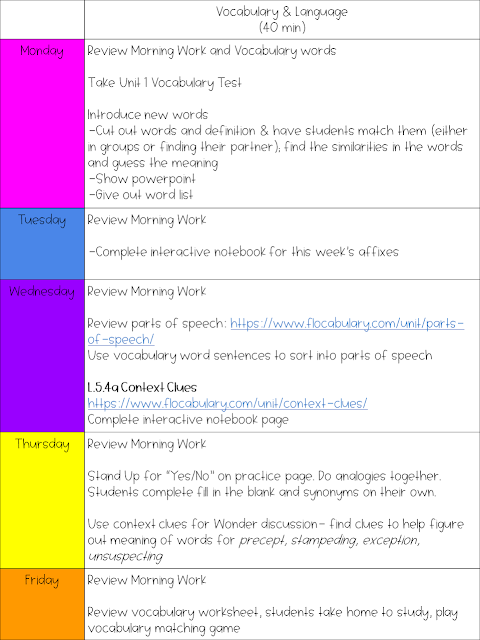 I also feel that giving 40 minutes to vocabulary and language also helps with writing to incorporate strong editing and revising lessons. 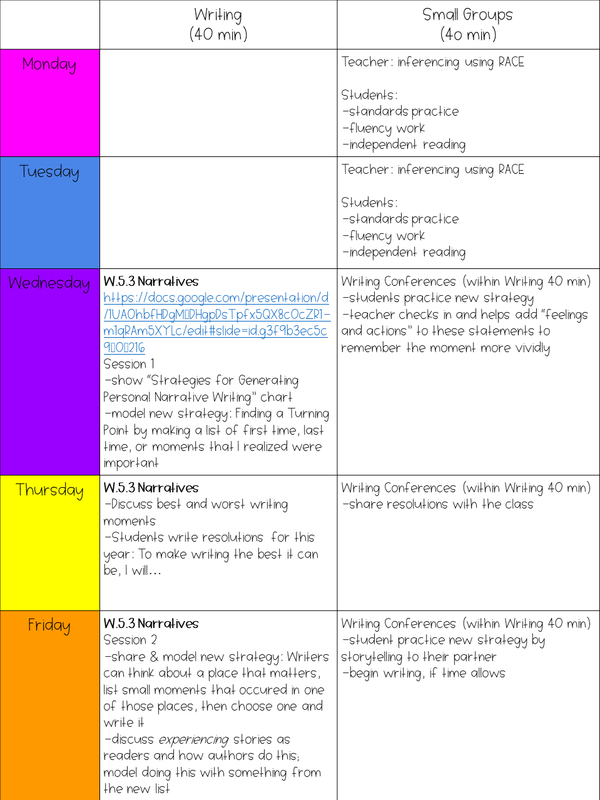 So I'm always teaching writing skills, but I need a designated time for writer's workshop so it can be successful. I'm using Lucy Calkin's Units of Study for the first time this year and absolutely loving it! 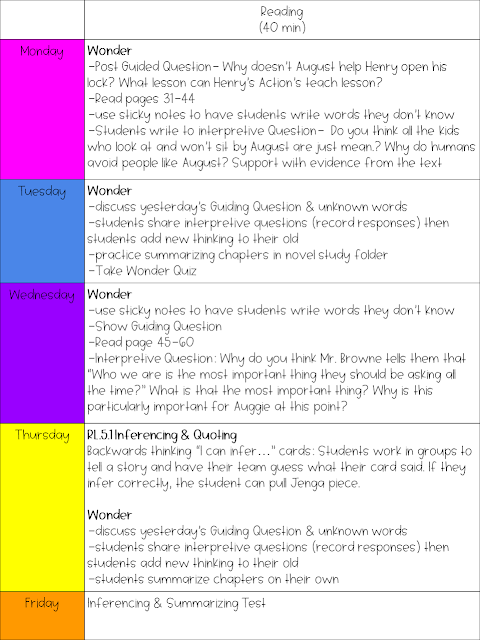 It's a strong guide to get writer's workshop going and functioning in the classroom. Plus, the lessons are deep and valuable! Check her out if you have not already done so. For small groups, I have 4 groups with various numbers of students in each. I meet with each group for 20 minutes and work on our reading skills. The other students are rotating through center activities. For Standards Practice, students are working on our essential standards. I've posted all about how this center works in this post. It's definitely the most important center I have and is purposeful. Independent reading seems so easy, but students need time to read and work on their stamina. I will sometimes assign a reader's response for them to do, but they really just need time to fall in love with books. This is their time to get in that 20 minutes of reading that is so important each day. 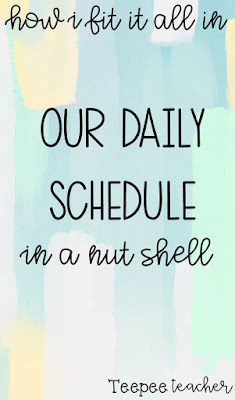 I am so excited to finally have a schedule that seems to work! 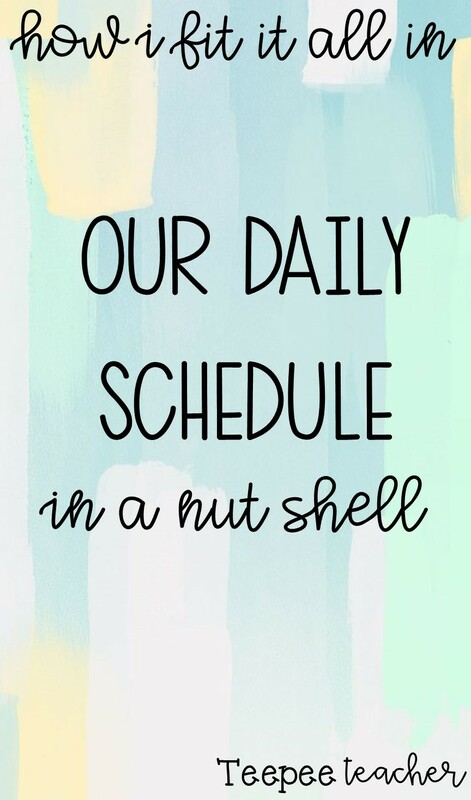 I like to have as much consistency as possible in my day to day activities so I think this schedule will be the saving grace I've needed. I'll let y'all know if I end up changing anything around, but I'm loving it so far! I hope you all are finding what works for you and your schedule. Hopefully this will help you if you're in need for some routines or timing of subjects.